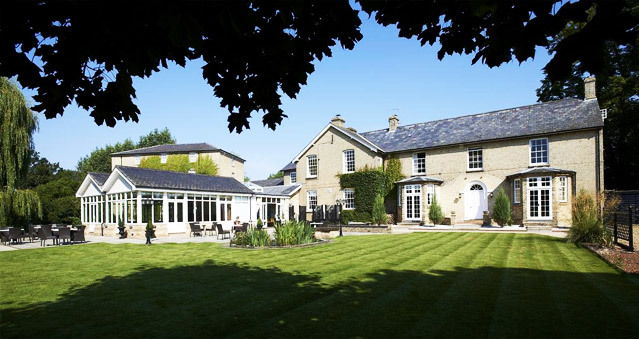 Quy Mill Hotel & Spa is a BW Premier Collection Hotel full of character and charm. Once a historic watermill, the Quy Mill is an award-winning countryside 4 star hotel, close enough to enjoy the sights of Cambridge and yet hidden enough away for a quiet break or a teambuilding event. The 51 bedrooms offering standard, executive, superior and deluxe four poster rooms with spa bath all have LCD TV’s with Freeview and coffee making facilities. Free Wi-Fi is available throughout all areas of the hotel along with ample free car parking. The hotel is ideal for your teambuilding activities, such as like The Killing, Around the World, Awakening the Dead, Stocks in the City, Mixology, The Ultimate Team Build, Real Life Clu’Doo, and many others. Quy Mill boasts a state of art leisure centre with 12 metre deck pool, spa pool, steam room, sauna, air conditioned gym, personal trainers (by arrangement) and jogging tracks. A comprehensive range of massages, facials, body wraps and exfoliations are available at the new spa. Quy Mill Hotel has achieved the AA 4 Silver Stars. Location: 5 miles from Cambridge city centre.